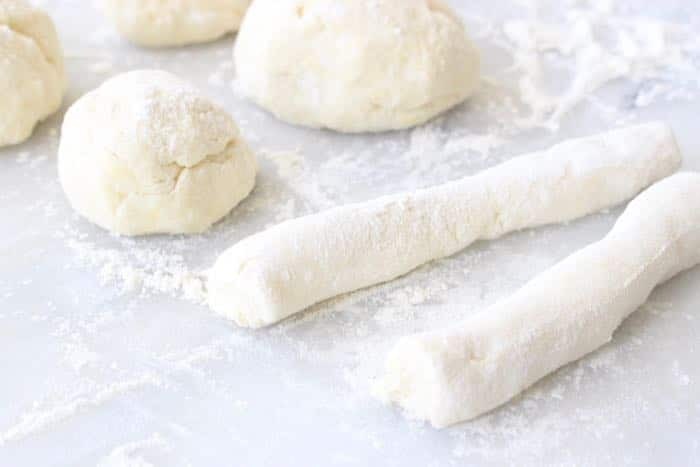 How to make the best, homemade ricotta gnocchi from scratch, step by step recipe tutorial and quick recipe video! 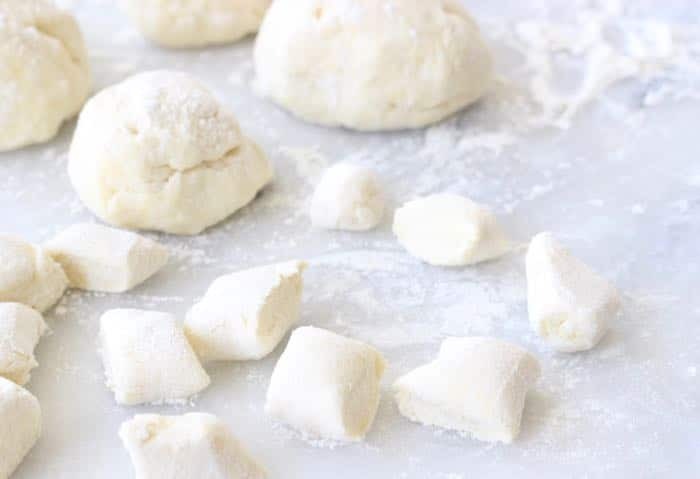 Classic Florentine dumplings or “ Gnudi “ made with whole milk ricotta cheese instead of potatoes, gnocchi are light and fluffy little pasta pillows with an airy, irresistible texture. You guys, once you make this recipe I doubt you’ll want to ever go for the store bought variety ever again. 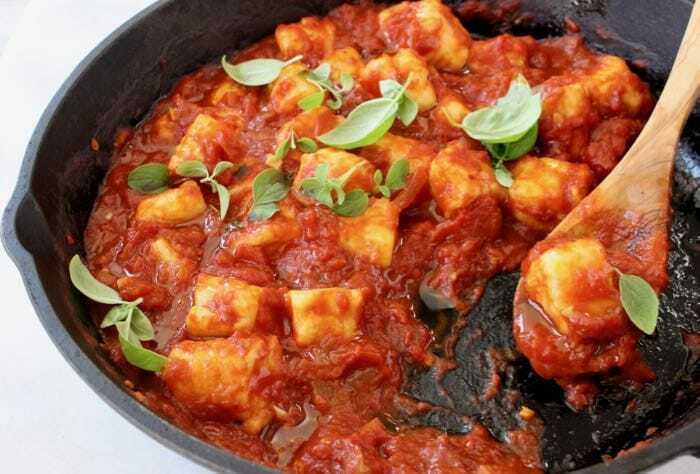 So easy to make, you can whip up a batch in 20 minutes while your tomato sauce is bubbling away on the stove top. Because I promised you this recipe last week here it is. After this one however, and in spite of my endless love affair with ricotta cheese, I’m excited to announce that the BatMan and I are going to embark on a plant based lifestyle! There are many personal reasons for this and I’ll get more personal in the next post, but rest assured there will be tons of guilt free deliciousness coming your way. One bowl is all you need to mix up some ricotta cheese, parmesan, egg and flour. Then you roll it into a few logs, cut 1/2 inch pieces and if you feel like it just roll them down the back of a fork to create little grooves for the sauce to stick to them better. I actually only do this when i toss them with a thick Marinara sauce like today. 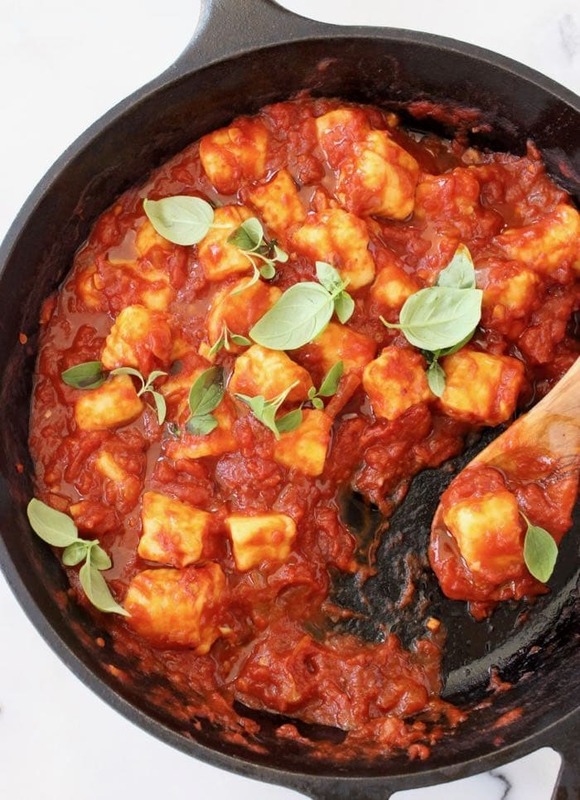 Which in my humble opinion is the best sauce for gnocchi ever. If I ever do a smooth, creamy truffle sauce for the holidays for instance, I just leave them as such. No grooves required. The less you handle the little Gnudi pillows, the fluffier they will be! make sure to drain the ricotta cheese for a couple of hours and get rid of all that extra moisture! do not overwork the dough! 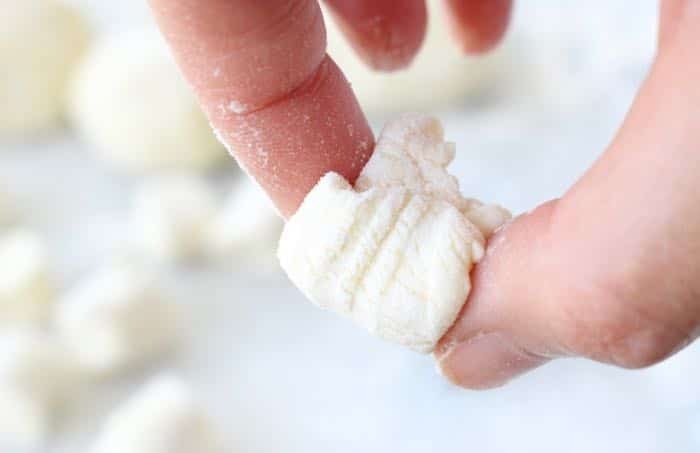 Gnocchi freezes very well, so you might want to make a double batch and freeze some for a last minute comfort dinner. 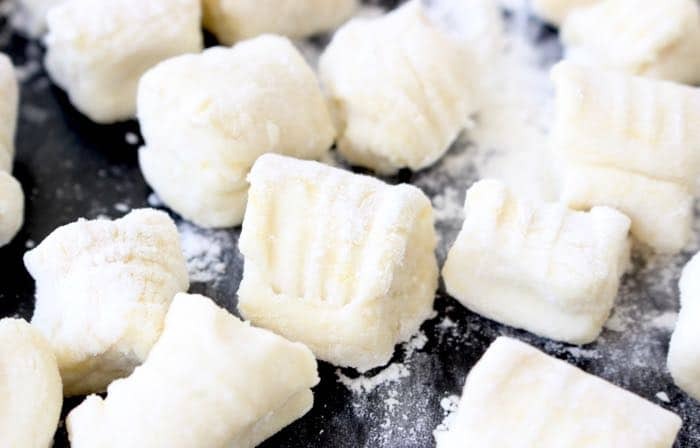 How to make the best, homemade ricotta gnocchi from scratch, step by step recipe tutorial and quick recipe video! Strain the ricotta cheese through a mesh sieve or a cheesecloth lined colander for a couple of hours or overnight. 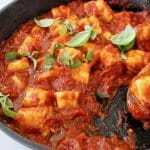 In a medium bowl combine the ricotta, egg, parmesan and 1 cup of flour. Sprinkle some flour on a pastry board and shape the dough into a round ball. Sprinkle a little more flour if you feel the dough s to sticky. Cut the dough into 5 pieces and shape those into baseball size balls. Roll each ball into a tube about 1/2 inch to 1 inch thick or so. 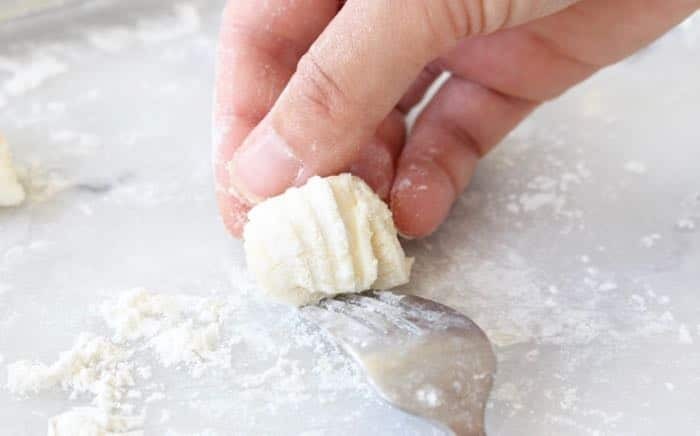 Use a sharp knife and slice the gnocchi into 3/4 inch pillows or so, depending on your preference. Place them on a lightly floured baking sheet and run each on down the back of a fork ( as shown in the video) to create little groves for the sauce to stick to better. Meanwhile bring a large pot of water to a boil. Salt it well, it should taste like sea water. Add the ricotta gnocchi to the boiling water and cook only until the little pillows flow to the top. Drain and toss with warm tomato sauce or all the order serving ideas above. 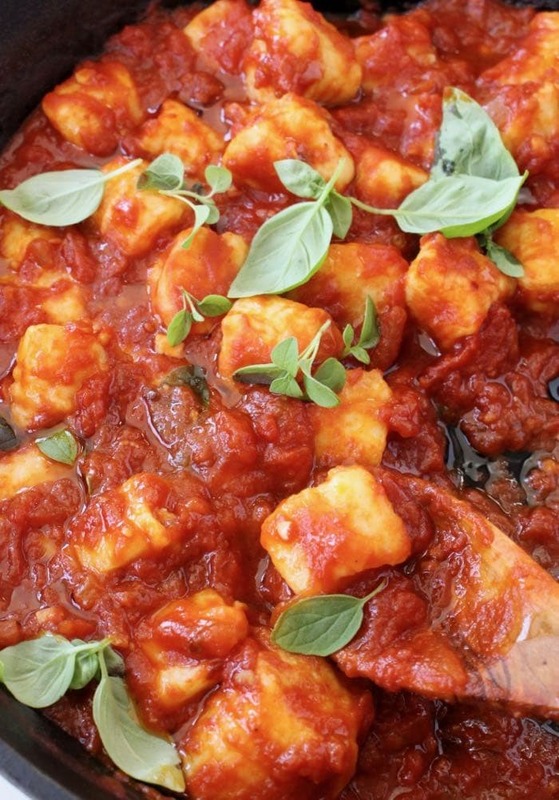 i have been wanting to make gnocchi for a while now..thank you for such a simple recipe! Thanks for the recipe!! I have been looking for one. May I freeze them after they are boiled? With plain dumplings I boil, rinse & drain them, then freeze in a single layer on a cookie sheet. After they are frozen, I put them into freezer bags for future use. 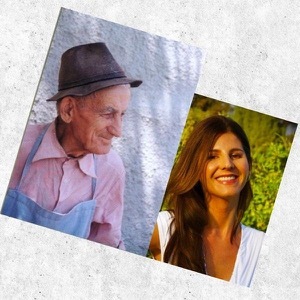 Can’t wait to read about your plant based recipe adventures…I have been shifting that direction for about a year, but just haven’t quite crossed all the way over…but I do feel so much better when I’m plant vs meat based…I’m ready to join in the journey…and will definitely try this this week….see, can’t quite make the crossover!!! I can totally relate to your struggle Judi. I found that giving yourself permission to fail at it is absolutely necessary! My main struggle is giving up certain cheese, but I am happy to report I just discovered a plant based smoked gouda cheese alternative that is both soy free and gmo free. I swear it tastes like the real thing and have been loving using it on tomato sandwiches. I get it at Whole Foods in the vegan section but hope to discover more diverse options along the way. On the bright side, I’m thrilled I can have pasta every day. I ordered a bunch of the above mentioned buckwheat noodles and always keep some variations of sauces in the fridge. So it helps get me through the day feeling great! I would give it a go, should be ok but haven’t tested it that way myself. Well you were right. I’m never using store bought Gnocchi ever again. Spent some quality time making these with my kids and they were truly fluffy and we ate them all in one sitting.